A Seoul-ful feast was the perfect cap-off from my trip to K-Drama lair, which is Digital Media City. 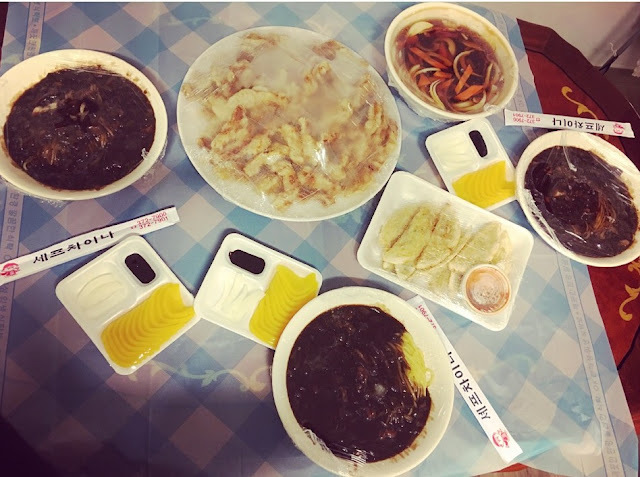 I was delighted to be treated with Korean Chinese Cuisine, Jjajangmyun with Tangsuyuk (Korean Sweet & Sour Chicken) and mandoo to boot. Thank you for the food. We ordered from this Korean-Chinese Restaurant. I wasn't able to take photo of the delivery guy, but food were delivered like how they are in Korean Dramas, in a stainless delivery box and in real plates. Teehee. There was also disposable tablecloth with it. I was told that they will just go back for the plates after sometime. Jjajangmyeon!!! Very timely, just saw Train to Busan and I was compelled to re-marathoned Coffee Prince, where Yoon Eun Hye's character, Eun Chan, delivers and devours plates and plates of Jjajangmyun.